My great-grandfather, Hyman Manoff, was born in 1884 in Odessa, in what’s now the Ukraine. This past May, I got a glimpse into my heritage by spending a day in my great-grandpa’s hometown. Hyman Manoff was my maternal grandfather’s father, and I was sort of named after him. 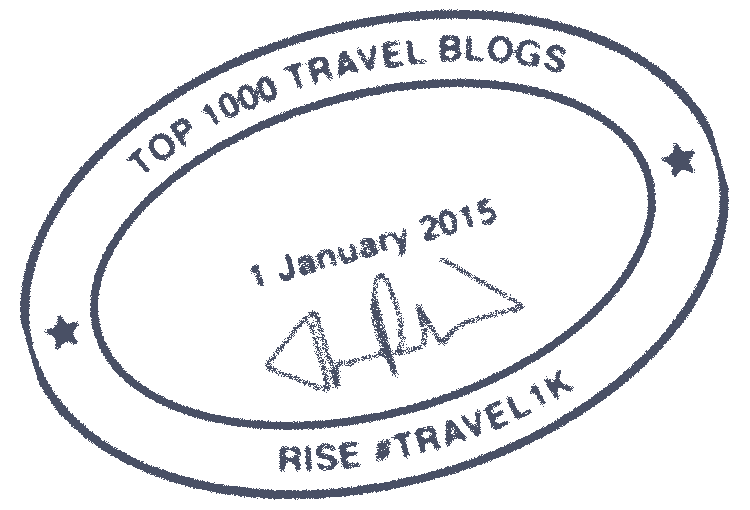 (My parents bestowed on me the Hebrew name of Chayim, which derives directly from my great-granddad’s first name; they then chose the relatively similar moniker of Harvey for the English-language name on my birth certificate.) At some point, Hyman married a woman named Sadie who came from the small Ukrainian village of Shpola. In 1905 he left Odessa and emigrated to the United States; he settled in Philadelphia, where he worked as an upholsterer. (I’m not sure whether Hyman married Sadie before or after his crossing of the Atlantic.) Hyman and Sadie had three children including a son Joseph, whose daughter Arlene would become my mother. And I’ve now pretty much exhausted the extent of what I know about Hyman Manoff’s life. He died in 1959, more than a decade before I was born, and I don’t even know what he looked like. 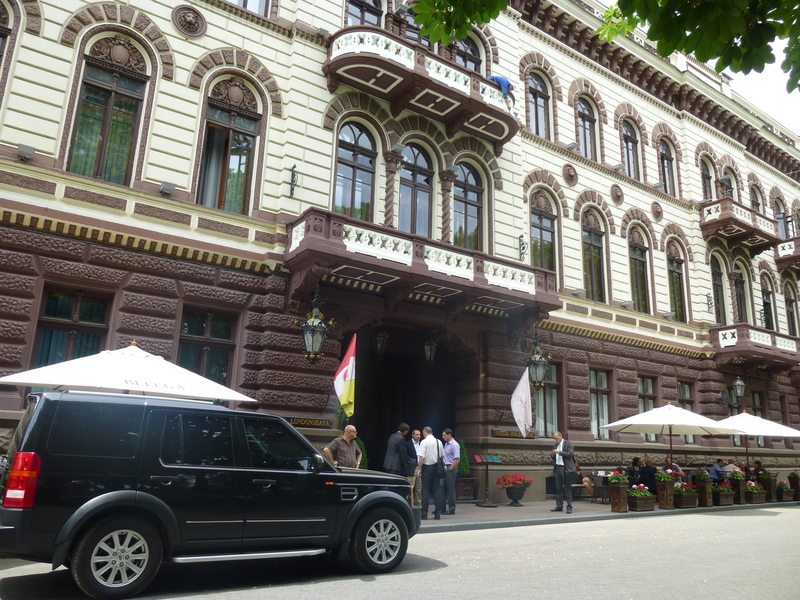 In May 2013, during my visit to the Ukrainian capital of Kiev, I took a day-trip to Odessa. 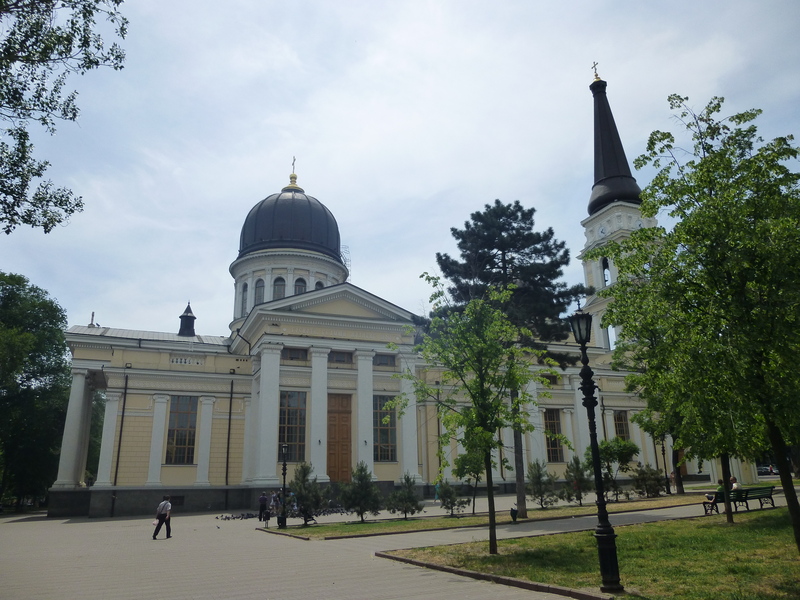 (I flew there from Kiev; the flight was about an hour long.) For several hours, I was privileged to wander some of the very streets that my ancestor must once have trod, and to gaze upon buildings and monuments that would have been familiar to him more than a century ago. 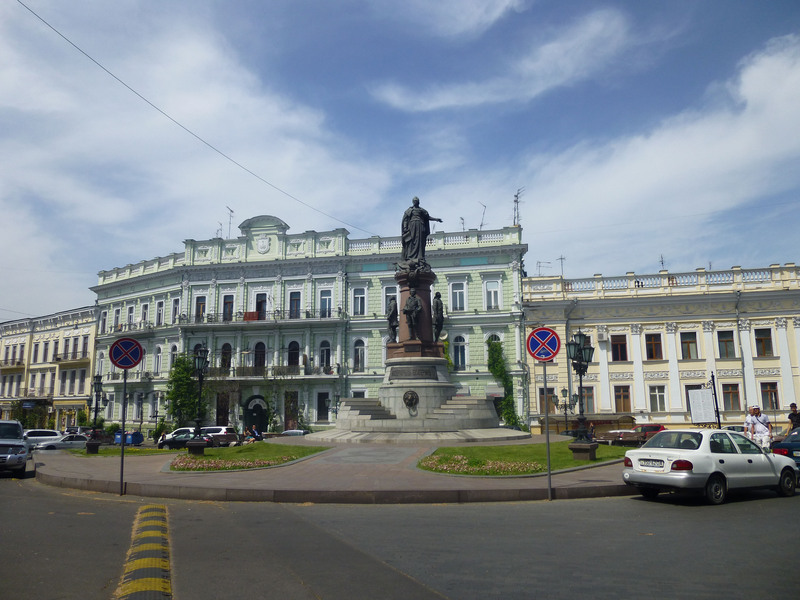 Odessa is a metropolis of just over 1 million inhabitants, making it the third-largest city by population in the Ukraine. My self-guided walking tour of the city began at a really long stairway. Looking down the Potemkin Stairs from the top. Looking up the Potemkin Stairs from one of the lower steps. 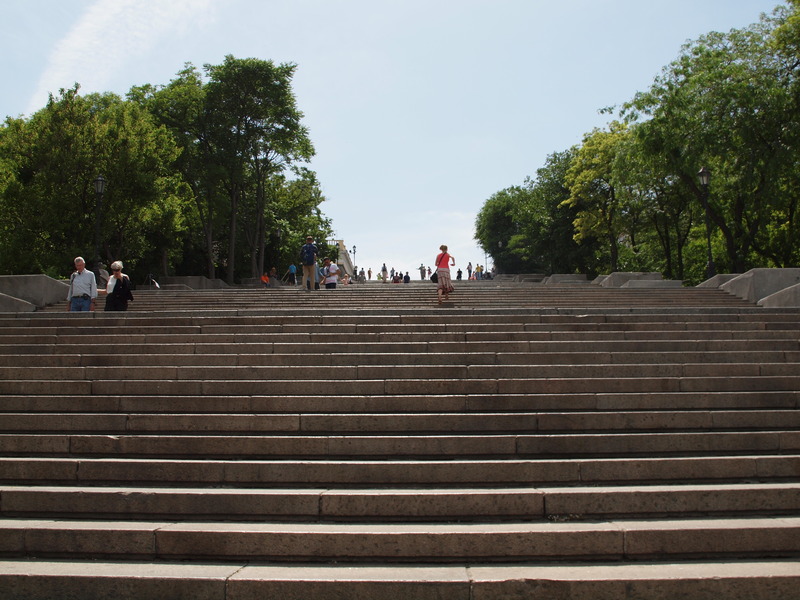 These stairs appeared in a famous scene in Sergei Eisenstein’s 1925 silent film, The Battleship Potemkin. 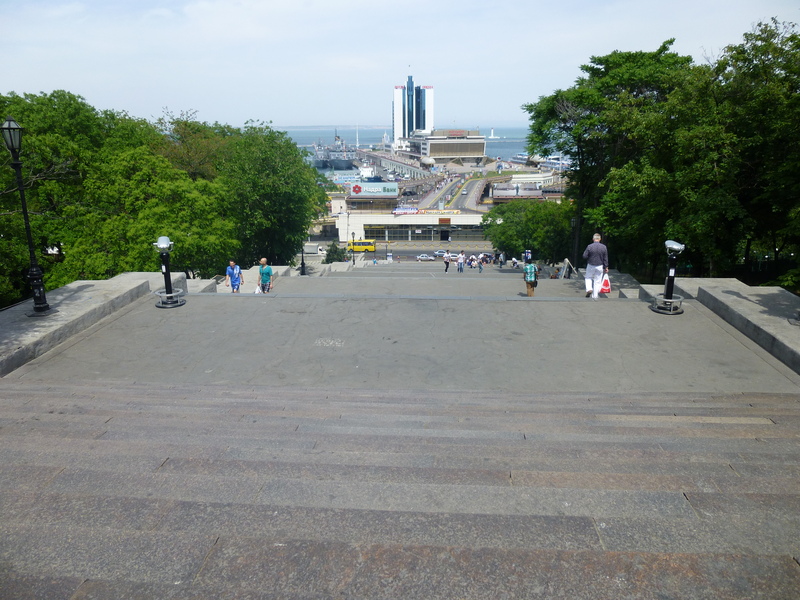 As you can see from the above photos, viewing the Potemkin stairs involves an optical illusion: if you look down them from above you’ll see only the landings, while the steps will be invisible to you; but if you look up them from below, you’ll see only the steps, and the landings will be invisible to you. 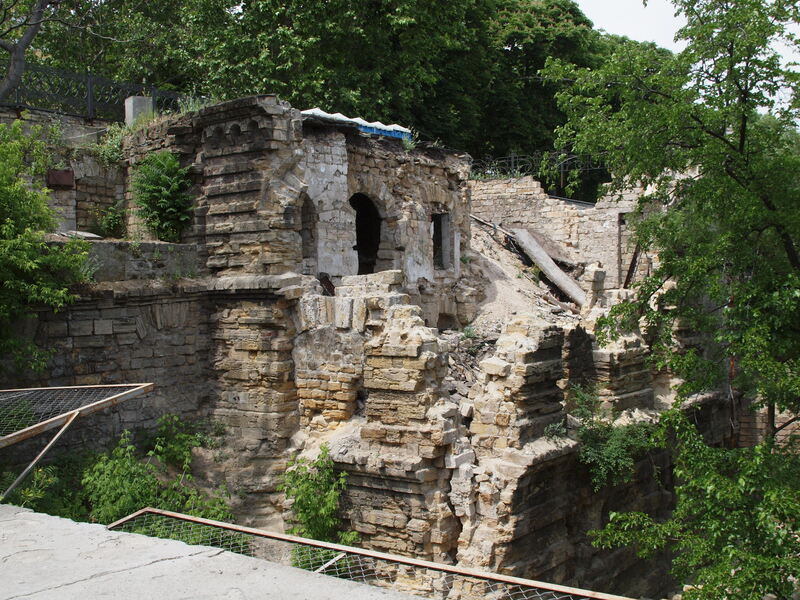 Ancient-looking ruins to the side of the Potemkin Stairs. I know that Odessa originated as a colony of ancient Greece, but I have no idea whether these ruins date back anywhere near that far. Although I did some research after my trip, I’ve been unable to ascertain what structure this heap of bricks used to be. If you have any idea, please let me know! At the top of the Potemkin Stairs (and visible to you as you’re climbing them) is a statue of Duc de Richelieu, who served as the first mayor of Odessa. (His full name was Armand Emmanuel Sophie Septimanie de Vignerot du Plessis, 5th Duke of Richelieu. That guy sounds like the French equivalent of Joey Jo-Jo Junior Shabadoo. 🙂 ) Fashioned from bronze, the monument to that unwieldily named nobleman was erected in 1828. The statue of the Duc de Richelieu, the first mayor of Odessa, near the top of the Potemkin Stairs. 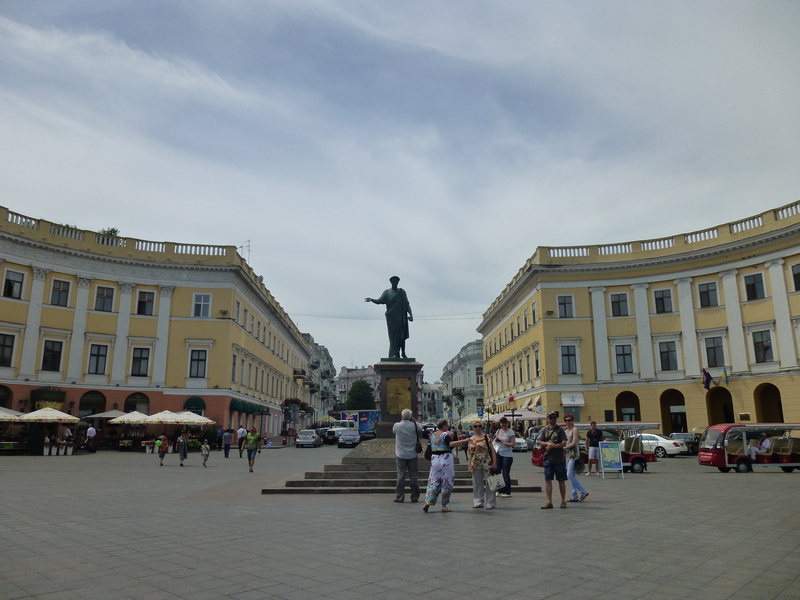 If you walk past the statue of the Duke and continue further away from the Potemkin Stairs, you’ll reach St. Catherine’s Square (Ekaterinenskaya Square), featuring a statue of Catherine the Great. Empress of Russia from 1762 to 1796, Catherine the Great issued the 1794 decree that founded the city of Odessa. Her statue was originally installed in 1900. However, in 1920, it was dismantled by the Bolsheviks and replaced by a monument to Karl Marx. The Marx statue is now long gone; reportedly it was destroyed by a strong wind. Apparently, like the man himself, Marx’s statue was on the wrong side of history! The memorial to Catherine was rebuilt on the same site in 2007; and the new version was designed, with the help of old photographs, to exactly replicate the original. Thus, while it’s not the same statue of Catherine that was in place in the early 20th century, it looks the same as the first statue would have appeared to my great-grandfather. St. Catherine’s Square featuring the recently reconstructed statue of Catherine the Great. 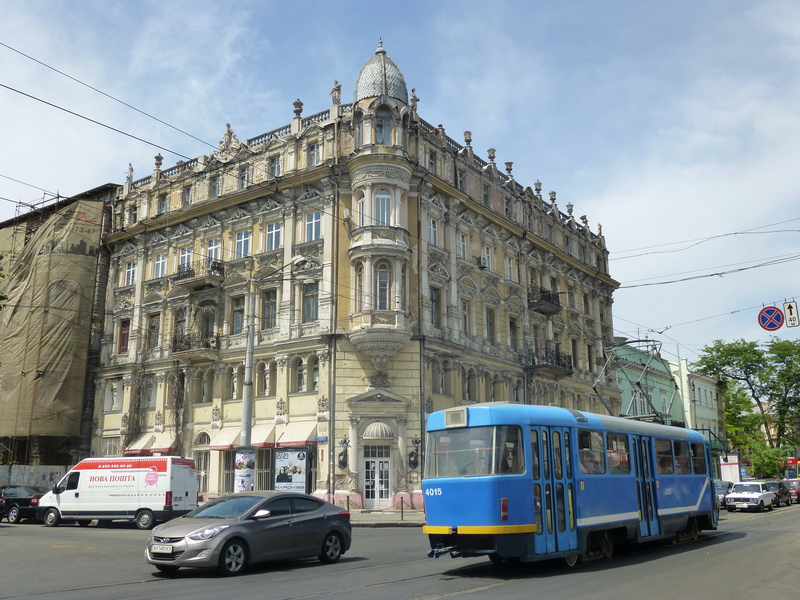 Among the elegant buildings on Primorsky Boulevard is the oldest hotel in Odessa: the Londonskaya, which opened in 1846. 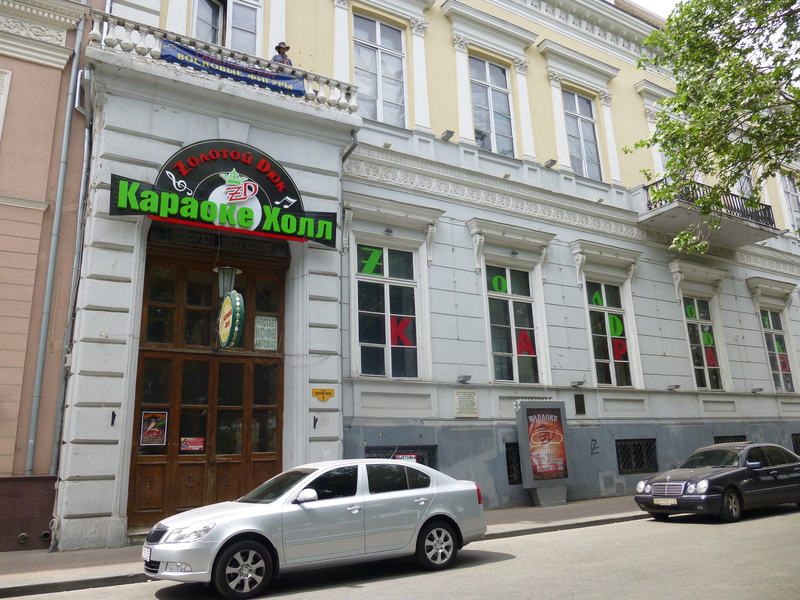 The Londonskaya, a grand hotel near the top of the Potemkin Stairs, is over 160 years old. 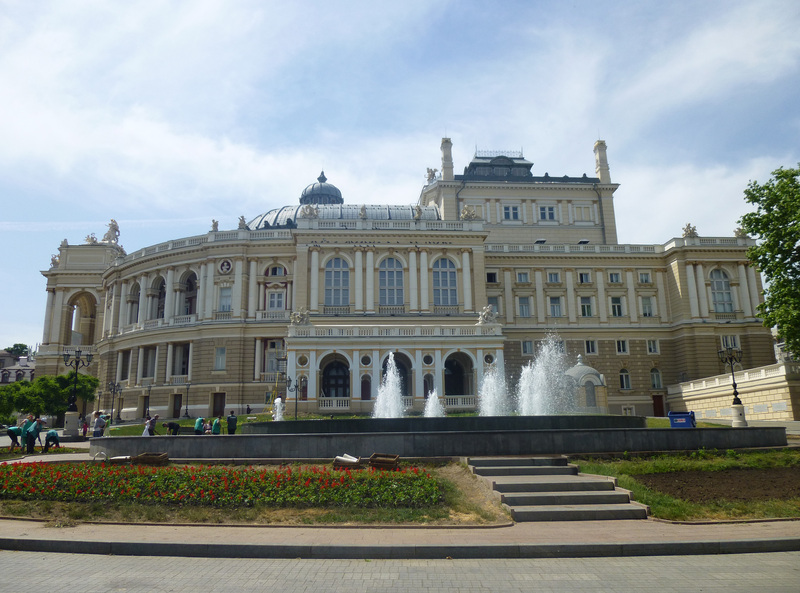 The Odessa Opera and Ballet Theater features gorgeous Baroque architecture. The address of this theatre is 1 Tchaikovsky Drive, which I think is pretty cool. 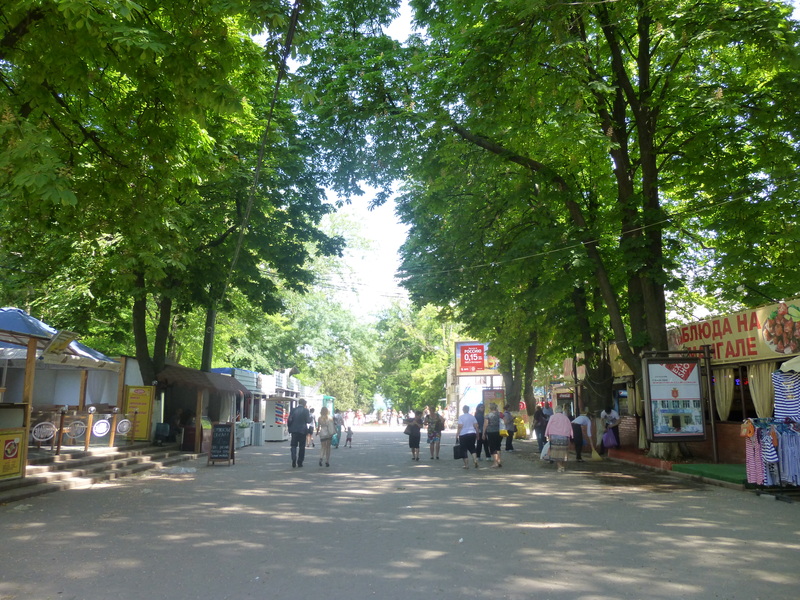 A view of Deribasovskaya Street. A building whose look I found pleasing, on Deribasovskaya Street. 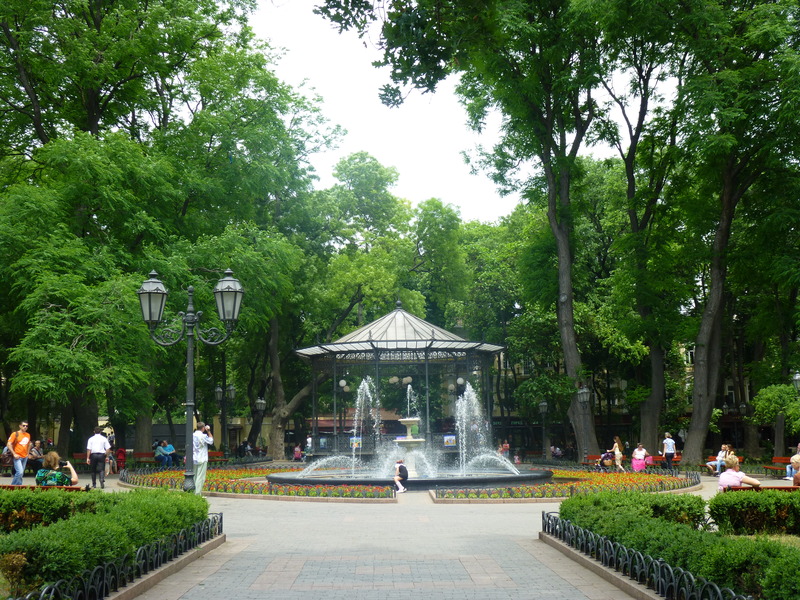 A fountain and gazebo in the City Garden. Another perspective on the City Garden. On the opposite side on Deribasovskaya Street from the City Garden is a spectacular indoor space: the Passage (pronounced “pa-SAHJ” by locals with whom I spoke). 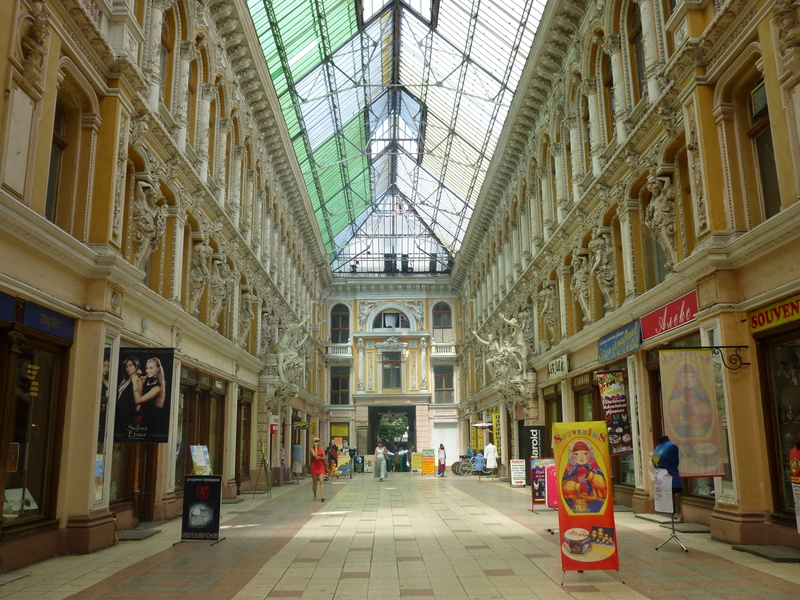 At the heart of the Passage is a grand L-shaped corridor, flanked by shops, with a glass roof high overhead. The building also contains a hotel. 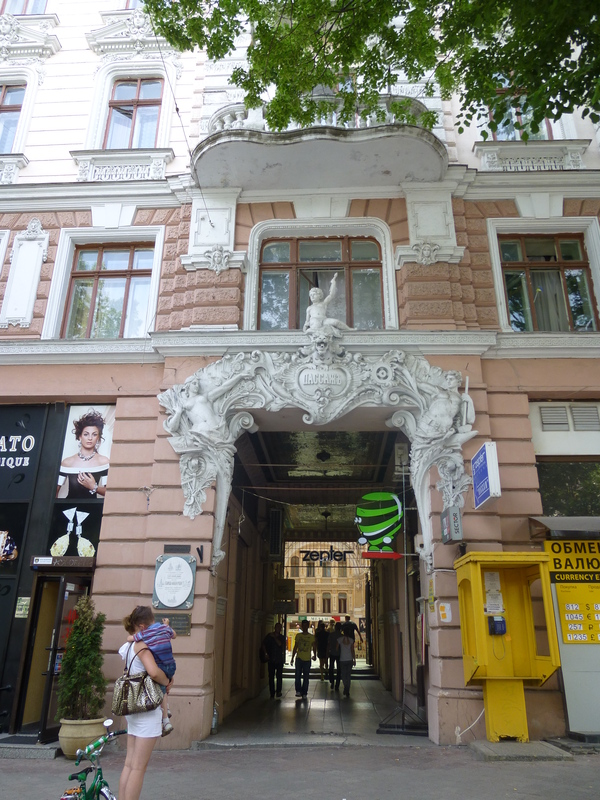 Like the Opera and Ballet Theatre, the Passage is a 19th-century building with a Baroque design. Adorning its central corridor are numerous sculptures in the classical style. The stunning interior of the Passage. One of the entrances to the Passage. I found this karaoke venue in downtown Odessa! Before we depart from downtown Odessa, I feel compelled to share with you one other edifice that caught my eye. It’s another example of how even some of the most random buildings in this architecturally-rich city are visually arresting. This is an unidentified Odessan building that I enjoyed looking at. 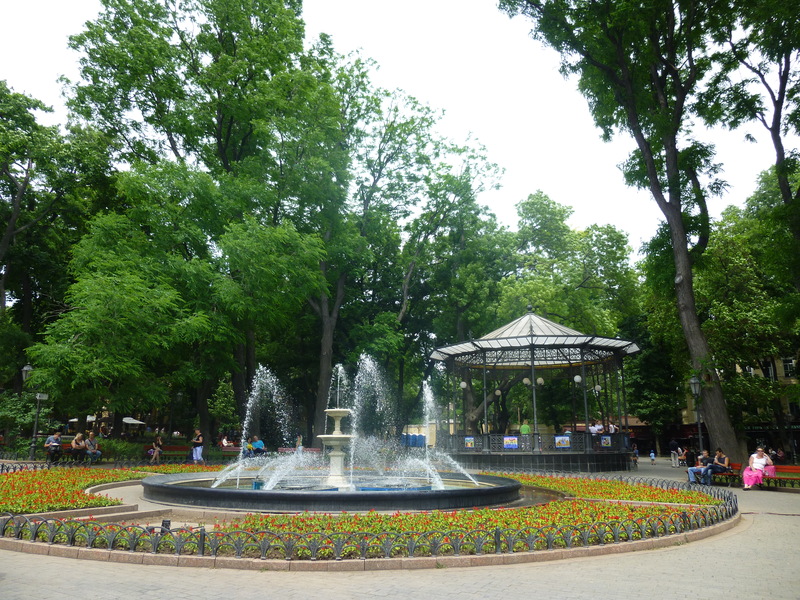 Odessa is situated on the Black Sea, and as such, one of the most poular recreational outlets for its inhabitants is its beaches. Probably the most prominent of those is Arcadia Beach. With my time in Odessa winding down, I jumped in a taxi to head over to that particular stretch of seashore. There’s more to Arcadia Beach than just sand and sea; a resort community has sprung up around it, and it abounds with trendy nightspots. To reach the actual beach, you stroll along a promenade. A broad, paved walkway serves as the approach to Arcadia Beach. Like any good seaside resort, Arcadia Beach offers bumper cars. 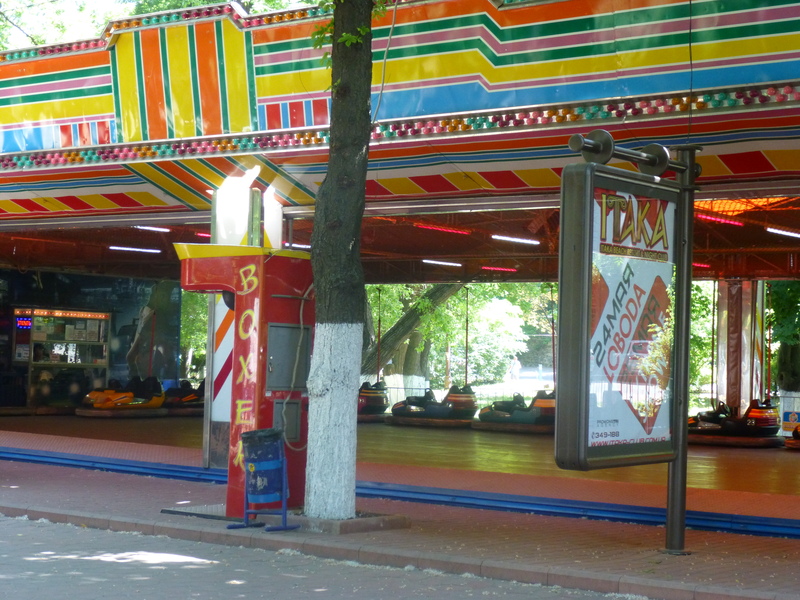 As you can see, these bumper cars have met a better fate than their counterparts in the Ukrainian town of Pripyat. At Arcadia Beach, looking towards the sea. That’s the Black Sea in the background! 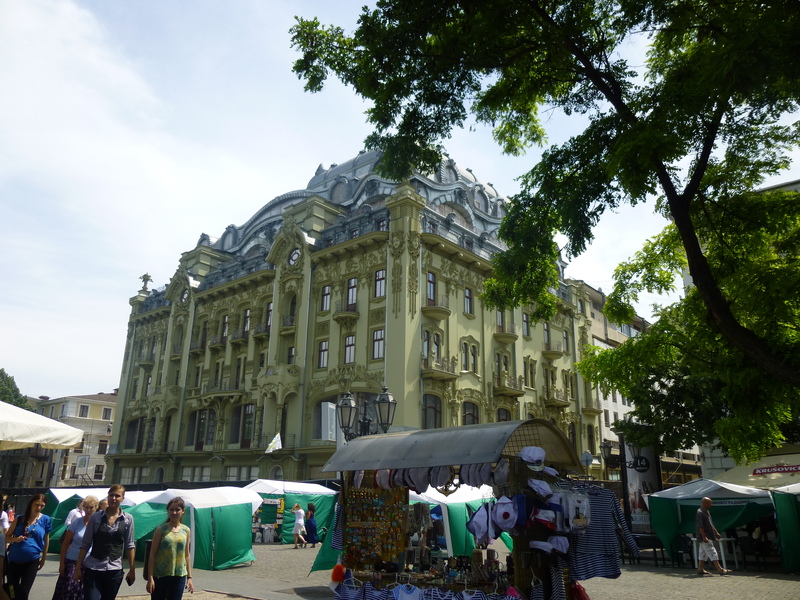 I could easily have spent much more time in Odessa; it’s a charming city whose buildings and other features are pleasant to look at. 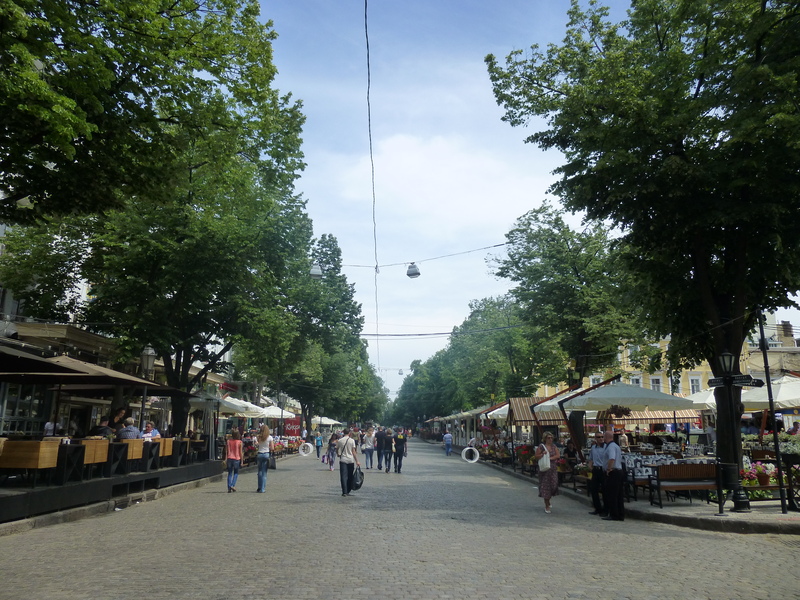 And of course, while I always enjoy discovering a city that I’m visiting for the first time, my introduction to Odessa had special meaning for me. Did Hyman Manoff run up and down the Potemkin Stairs, Rocky-style? Did he attend any performances in the Ballet and Opera Theatre? Did he take a meal inside the Londonskaya Hotel? Did he go to Arcadia Beach on a hot day and swim in the Black Sea? I don’t know the answers to these questions, but it’s fun to imagine him doing those things. What I do know is that, 129 years after his birth, I saw the town where he was born and raised. In so doing, I learned a little more about where I came from. 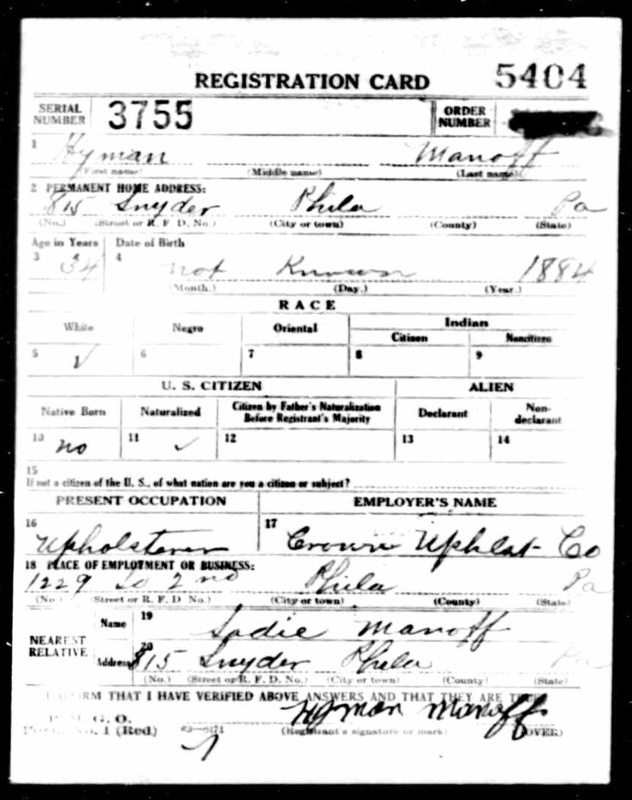 This is a registration card for the military draft that my great-grandfather filled out in 1918, during World War I. This document was found via ancestry.com. Would you like to explore the places where your ancestors lived? Excellent post! Knew them as the Odessa Steps. Saw Potemkin a long time ago, but it was a brilliant film for the silent era for sure! @Toemailer: Thanks! Yes, the Eisenstein film was amazing. And it was pretty awesome to think that I was retracing some of my ancestor’s footsteps.